We are pleased to announce the winners of the Verner Wheelock Excellence Awards 2016. The Awards, launched in 2015 to coincide with our 25th Anniversary, recognise the achievements of delegates who have attended Verner Wheelock courses, either at our premises in Skipton, or in-house at their own premises. There are five different Excellence Awards – for HACCP, Auditing, Food Safety, Individual Excellence and Company Excellence. The recipients of awards in HACCP, Food Safety and Auditing were nominated by Verner Wheelock course tutors as having been enthusiastic, highly competent and had understood the subject well. All had scored highly in advanced Level 4 examinations. The final decision for the winner of the Company Excellence Award was difficult, but in the end we awarded it to a company that has trained with us for several years and whose delegates all achieved excellent results this year. 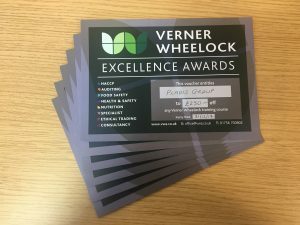 In addition to receiving an award and certificate, the winners also receive a voucher towards their next Verner Wheelock training course. Watch this space for pictures and comments from our award winners!